I have to admit I had no idea what these Cornae were when I picked them up in one of my favourite import shops. I did see the phrase "American corn snack" on the front of the packet and instantly thought "how bad can they be?" 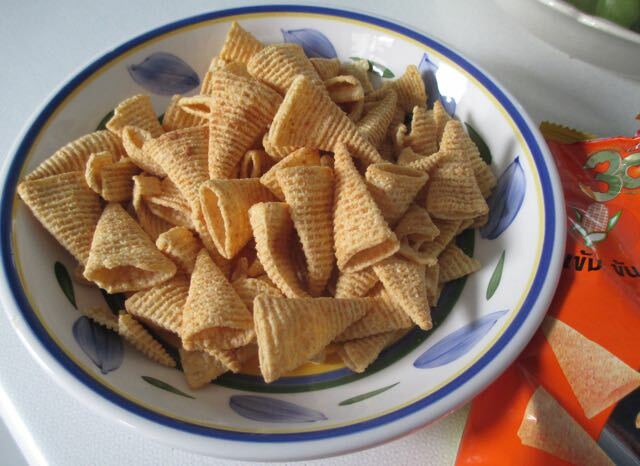 Well I popped the open the packet today after a certain amount of avoidance and thought the little corn cones were quite smart, so I took a photograph. They have a decent crunch and mainly taste of soy with a hint of paprika. They are moreish, as I just couldn't stop eating them and they didn't distract from the rest of my lunch. The bag was pretty big too so they'd be good in front of a film with a decent fizzy beer or two. This goes to show that an adventurous side to snacking can pay off, so I'd recommend giving import shops a try. Pick up something you fancy, like these Cornae, and I reckon you'll be pleasantly surprised. 56g bag with 160 calories, 10g of day and 1g of sugar. Ingredients included; corn starch, palm oil, seasoning, sugar, iodised salt, containing wheat, gluten, soy beans, and milk products. 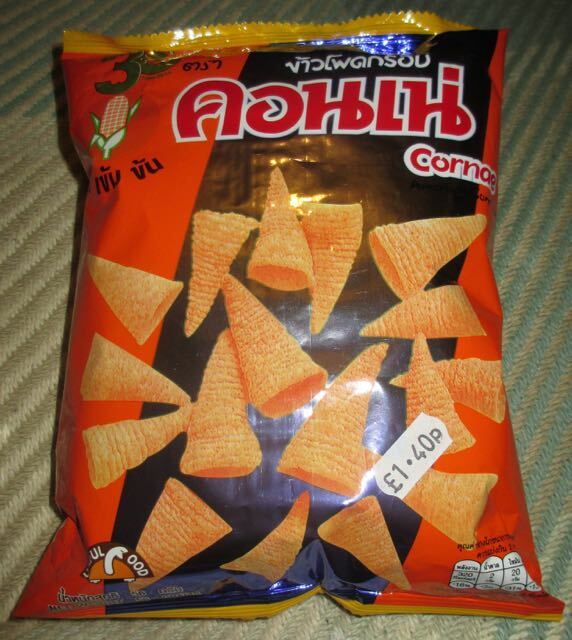 this crisp is from Thailand.